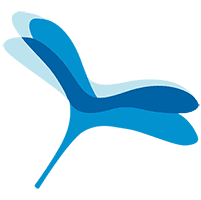 The DreamAir logo was shaped after a maple tree seed. This seed, with its helicopter-blade shaped samara, represents a very unique mastery of the air. Air is the canvas on which perfumers write and we too must grasp this mastery to create truly atmospheric sculptures. The maple seed pod also represents the organic nature of many of the ingredients we use in perfumery: their delicacy at times, their strength at others. As per a quote from Scientific American: “the acorn might not fall far from the tree but maple seeds can really go the distance”. The shape of the logo is also happily reminiscent of other ingredients such as flowers and leaves which too are important in our work. Finally, it is positioned as a hummingbird hovering over DreamAir: a buoyant symbol of air mastery married to elegance, subtlety and preciousness. Taken separately, the blue and white DreamAir colors touch upon the fact that perfumery necessitates an intimate and obsessive mastery of the liquid phase (blue), in order to control precisely what will reflect in the aerial phase (white). Ultimately, what our nose will see and what our brain will decipher. As an ensemble, the blue and white DreamAir colors provide a refreshing contemporary feeling and suggest dynamism. They represent the singular molecules (natural and composite) that have been used by perfumers in most landmark fragrances for the past 125 years to reach new heights and to transcend Nature, just like musicians, painters and architects do. We want DreamAir to go off the well-beaten path of present scent uses and explore new realms for our senses.